H2O, your local hot tub supplier. Based in Nottingham we have manufactured a range of hot tubs specifically made for the UK climate. We've worked in the industry for a number of years now and have used all of our knowledge and feedback from customers to develop a quality and affordable range of hot tubs. For year round enjoyment of your hot tub, we've included some great features and functions such as LED mood lighting to set off your garden on those darker evenings and temperature controls which allow you to set the water in your spa to the required temperature. On a hot sunny day it can be perfect for you to cool down and on those colder autumn and winter days & evenings simply increase the temperature to soothe aching muscles and relax your body after a hard days work! Based in Nottingham, we are your local supplier of hot tubs. We have a range of quality hot tubs in stock for speedy delivery to your home. And with our extensive range of colours and styles, you can customise your hot tub to suit your individual style. Choose from grey, black or chocolate exterior and enhance your garden with a hot tub interior colour from standard white through to blue, grey or copper. Enjoy finding your dream hot tub and customise to suit your style! 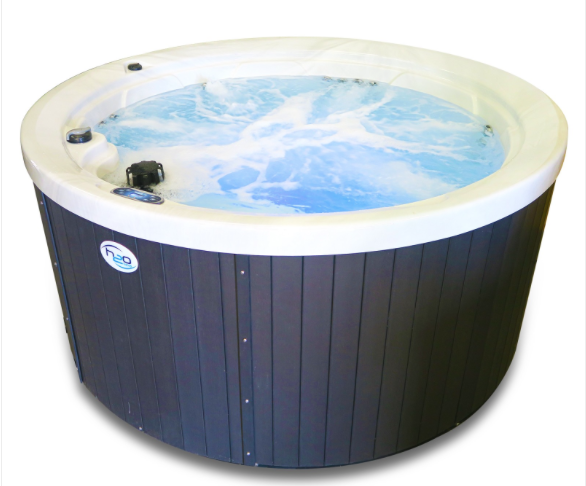 Take a look at our range of hot tubs in stock now for fast delivery! Find out more about H2O hot tubs today and buy with confidence. An easy deposit of just £100 secures your hot tub, so you can browse online and choose the perfect hot tub for your home. If you're looking for the 'wow' factor, how about our hot tubs with waterfall features. Stunning at night, these include LED lighting to really set your hot tub off. USA based Balboa water group have also now introduced BWA wireless controls so you can control your spa from your smart phone or tablet. This means you can set the jets running, change the temperature etc. whilst you're getting ready for a dip. We've added these to a couple of our hot tubs for 2015 - a great little feature! Read more about Balboa controls at the official balboa water group website, we wouldn't use anything else in our hot tubs! We provide hot tubs Nottingham including delivery, installation and servicing too.